Perfect Sear Grilling is a lifestyle. Live it at PerfectSear.com! You shouldn’t grill vegetables and eat them because they’re good for you—you should grill vegetables because they are easy to cook and delicious to eat. The healthy benefits are just an added bonus. 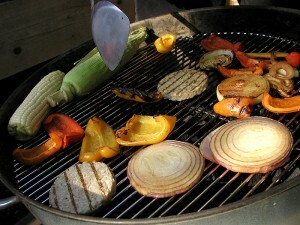 Grilling vegetables is a quick and easy, healthy, and mouth-watering proposition. The preparation involves cutting and some olive oil, the cooking may involve a flip of two, and the results are almost astonishing. Who knew vegetables could make your taste buds dance in appreciation? It’s really quite simple. First, choose your vegetables. The ones that taste best on the grill are the vegetables that naturally have high water contents: asparagus, bell peppers, cherry tomatoes, eggplant, onions, mushrooms, summer squash, and zucchini. If you love vegetables don’t feel like you have to choose just one vegetable to grill. Live a little and use all of your favorite varieties at the same time. They are good for you, feel free to splurge. Next, decide how you want to cook the vegetables on the grill. The possibilities are nearly endless with options including skewers, grill baskets, and tin foil, to name a few. Another option that is always available to you is to simply place the vegetables directly on the grill to cook (that’s how you get those trendy grill marks that are all the rage in the summer months). No matter which option you choose, though, keep in mind that all of the vegetables should be cut to be about the same size so that they cook in the same amount of time. If you are grilling your vegetables on skewers, cut your vegetables using a golf ball as an approximate judge of size. If you’re having a social gathering, it may be a fun idea to pre-cut all the vegetables and allow your guests to create their own skewers to taste. After the skewers have been made, use a brush to lightly coat the vegetables in olive oil. You may also add kosher salt and pepper to taste—other spices are unnecessary. Keep a close eye on the vegetables after you place them on the grill on medium heat, turning occasionally until lightly browned, about five minutes. Follow the same steps if you choose to cook your vegetables on the grill with a basket of tin foil. Just place the mixed vegetables in your desired cookware and place on grill on medium heat until cooked thoroughly. Be careful not to burn your vegetables, as they tend to cook faster than you may think. If you are grilling the vegetables directly on the grates, you must cut them in bigger chunks so that they do not fall through. After washing the vegetables thoroughly, slice onions (sweet Vidalia onions are particularly delicious), zucchini, and summer squash into about ¼- ½ inch thick rounds; slice bell peppers in half lengthwise and be sure to take out the core and seeds; Portobello mushrooms and asparagus are also great options and do not need to be cut, unless they are too big. Next, lightly coat the vegetables with olive oil and season with salt and pepper to taste, and then place on the grill. Grill on medium heat, 2-6 minutes on each side. No matter how you decide to cook these vegetables, they are perfect every time. Just be sure to wash them, use olive oil, salt, and pepper, and to turn them frequently if you are worried about overcooking them. You will be surprised to find how delicious vegetables can be, and you will feel good about eating them because they are great for you and easy to prepare and cook. They also compliment almost any main dish. Enjoy!